Digital devices with e-reading functionality, such as the Kindle and the iPad, are now commonplace, seen in buses, coffee shops and classrooms. We know, from simple observation and from research studies (Researching Readers Online, 2012) that young people read increasing amounts of literature of all types on digital devices, and that more and more reading material is being produced for digital devices, either as digitised conversions from print or as digitally ‘original ’ editions. The importance of digital literacy has been stressed (see for example the 2010 white paper from the Knight Commission entitled Media Literacy: A Plan of Action) and there is an assumption within education and across society generally that digital devices are the future, for communication, for entertainment and for reading. But within that large and generalised assumption, there is a problem, which has not yet been systematically researched: we know very little about how digital devices impact upon the reading experiences of the young people who increasingly use these devices. Living and working with digital devices from a very early age, young people read large amounts of textual material on mobile phones, tablets, and computers. 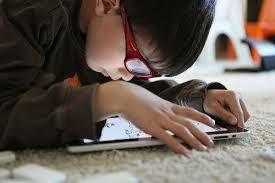 But what is going on when children use digital media to ‘read’ literature? Digital ‘books’ might be very good at engaging some young readers, but alternatively their interactivity and multimedia elements might be distracting and therefore very bad for encouraging some young readers to read. 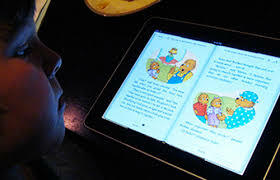 There have been many studies in the educational disciplines on the issue of whether digital media are impacting upon the reading habits of children. But mostly these studies have been interested in whether media such as TV, the internet, mobile phones, games, reduce the amount of ‘book’ reading that children do (e.g. recent OFCOM reports). There are few studies on the question of whether digital devices, and the functionality that such devices offer, have changed the experience of reading itself. There are precious few studies of reader response in children at all, and this in itself is a major gap in our knowledge of how and why children enjoy reading. But as we move ever more rapidly into the digital age where ‘books’ are now downloadable into Kindles and iPads, and literature becomes interactive and multimedia (e.g. Alice for the iPad, or Moonbot’s The Fantastic Flying Books of Mr. Morris Lessmore) we are certainly seeing changes to narrative form and reading experiences that should be studied. The lack of focused research does not indicate a lack of importance for this study: there are, as noted above, studies looking at digital reading habits – but the less visible issue of the experience of digital reading, and the more technical issue of the design of digital literature, have been overshadowed by the more politically controversial debates around the impact of media upon print reading. Furthermore, the relationship between the experiential and the technical in the field of literature, has also been under-researched (see Pope 2006). Reading experience and digital technology live together now, but are rarely studied together, because of the different traditions and knowledge-bases of the two fields. We know that digital devices are used, a lot, and the untested assumption is that this is good, and that digital devices are part of the future of reading and learning. Schools and libraries invest in expensive equipment so that digital and interactive stories may be read. But what exactly is the experience of young readers when using these devices? Here we lack insight, as the following brief survey of reader response and digital and interactive scholarship demonstrates. Whereas ‘traditional’ literary theory and criticism sprang from the assumed authority of ‘experts’, reader response theory and research (Fish 1970, Holland 1975, and Iser 1976) essentially demonstrates that the experience and reactions of the reader to a text are as significant as the text itself, and are integral components of how a literary text works. Reader response studies are now considered important in many fields of literary study (Miall 2000), including, as we shall see, digital interactive literature, where they seem of particular importance due to the development of new technologies and the use of forums and other online spaces for literary discussion. However, in the field of children’s literature, reader response is hardly heard of. Critical responses to literature aimed at and read by children are very much the preserve of adults, whether academics, teachers, librarians, or reviewers – children are rarely consulted. Notable exceptions are studies by Rudd (1992), and Pope and Round (2014). Early digital ‘hyper-texts’, read on a PC, (e.g. Joyce’s afternoon, a story, 1987, Moulthrop’s Victory Garden, 1992) were the earliest full-length fictions to incorporate reader interactivity – giving readers the ability to affect plot and character development via hyper-linked words and sometimes images. With the advent of much more powerful personal computing, and very portable devices such as iPads and Kindles, interactive digital literature is now rapidly evolving, and enthusiasm for its latest iterations is much wider spread. Publishers are now starting to develop interactive digital work as adaptations (Eliot’s Wasteland for the iPad) or original fiction (Rob Sherman’s Black Crown). For children, publishers such as Nosy Crow are now rapidly developing new digital interactive titles, such as the Bizzy Bear series, and there is a large number of interactive reading ‘apps’ on sites such as the Apple App Store. There is no doubt that digital devices will become more and more prominent and familiar as the places where children ‘read’ their literature. Equally there is no doubt that ‘literature’ for children will become more and more interactive and multi-media in form, in the digital environment the other hand, alongside the undoubted enthusiasm and rapid development, the critical, academic and empirical discussions of interactive literature (for example Kendall (1999), Miall and Dobson (2001), Pope (2010)) all tell us that there are some serious issues around aspects such as reader absorption, navigation through complex, multi-threaded narratives, and the integration of multi-media elements. There is, for some, doubt that strong narrative can be interbred with digital and interactive media. A preliminary review of critical literature including literary reader response studies (e.g. Holland 1975, Nell 1988), computer interface design (e.g. Nielsen 1989, 1990) and findings from previous relevant empirical studies (e.g. Pace 2003, Pope 2006, 2010; Pope and Round 2014), as well as understandings and debates from discursive material (e.g. Douglas 2001) reveals that readers of interactive/digital literature react to aspects around the device features such as portability, brightness of screen, reading tools (page turning, indexes etc), interface design; we also know that aspects of interactivity and multimedia have an impact on reading pleasure. This review was conducted in support of a proposed study to re-examine these known aspects of digital reading in relation to children and digital and interactive literature aimed at children. The proposed study was intended to be exploratory and qualitative, not aiming to test a hypothesis, but to uncover how children respond to reading interactive literature on digital devices. We were unsuccessful in gaining this funding, but intend to resubmit a reworked bid in future, and so would be grateful for any feedback or comment on the issues raised. FISH, STANLEY, 1970, ‘Literature in the Reader: Affective Stylistics’, in New Literary History, Volume 2, pp 123-63. MOULTHROP, STUART, 1991, Victory Garden, USA, Eastgate Systems. NIELSEN, JAKOB, 1990, ‘The Art of Navigating Through Hypertext’ in Communications of the ACM, March 1990, Vol 33, No. 3 pp 296-310. PACE, STEVEN, 2003, ‘A Grounded Theory of the Flow Experiences of Web Users’, in International Journal of Human-Computer Studies, Volume 60, Number 3, March 2004, pp327-363. POPE, JAMES and ROUND, JULIA, 2014. ‘Children’s responses to heroism in Roald Dahl’s Matilda’, in Children’s Literature in Education. New York: Springer Science+Business Media. 18 October 2014. RUDD, DAVID, 1992, A Communication Studies Approach to Children’s Literature. Sheffield: Pavic/Sheffield Hallam University Press. Thanks for the great literature review and analysis. What I find interesting is that older readers (middle school – YA) seem to be less interested in interactivity and more interested in gripping linear stories. I suspect there will be more reading of long-form text on phones, as is the case with Wattpad, but apart from photos or videos used as chapter headers and the capacity to add comments (true reader response! 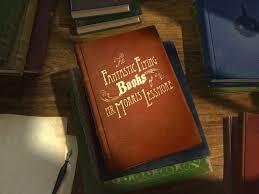 ), the stories published there are pure, uninterrupted narrative. It may be an interesting site to explore, actually, as it’s built on the idea that people want to share stories, often serially and usually on phones. Most of its members (so far as I can tell) are teens or early adults. Thanks Barbara – that’s a really interesting point. Do you think maybe they view such things (and use of imagery etc) as ‘babyish’ or similar? Or another reason…? Thanks for the Wattpad reference too – will definitely check it out as very interested in how people use these sorts of spaces.